We provide Terracotta floor cleaning in Cheshire. Stripping and re-sealing of Terracotta floors. Terracotta floor tiles come in many different designs and have been around for hundreds of years. These days they are mostly factory made but there are suppliers that still supply rustic hand made tiles. Terracotta floor tiles are naturally porous due to being made of clay and will readily absorb dirt and stains if left untreated and sealed. When the seal breaks down or wears off, it will be necessary to have the floor stripped and cleaned. The floor once cleaned will then require sealing. We have provided Terracotta floor cleaning in Cheshire for since 2001. We can also advise on which type of Terracotta floor seal may be appropriate for your floor. Contact us if you are thinking about having your Terracotta floor cleaned in Cheshire and we can also give you a free no obligation quote. This Terracotta floor was part of a kitchen, hall and dining area at a clients home near Tarporley. The lady had recently moved into the property and was recommended by a friend. The work took 2 days to carry out and the customer was delighted with her newly refurbished floor. The floor was finished with a satin finish polymer seal. This Terracotta floor is a in a small kitchen. The client had tried in vein to remove the old seal from the floor in an attempt to hopefully improve its appearance. This floor may have been around 20 to 30 years old which had an unknown seal applied some time ago. The seal was vey difficult to remove even with strong stripping chemicals. The job was completed in one day and the results were worth the effort! This Terracotta floor in Northwich had been re-sealed many times by the owner which had trapped dirt between the layers of the old polish. The build up of old layers of polish were removed with specialist strippers and a rotary scrubbing machine which took around 12 hours to complete. The floor was then sealed with a high gloss polymer seal which has enhanced the lovely colours. The floor will now be protected from stains and very easy to clean and maintain. Yes, we are trained and accredited by Prochem UK for floor cleaning and restoration. We are also insured by AXA specialist cleaning insurance. Details and a copy of insurance are available on request. We have been in business since 2001 and during that time, most of our work comes from recommendations and referrals. It is our intention that you are delighted with our work and we know that our clients want the best possible results for the money they pay. See testimonials here from some of our clients and gallery here of some of the results that can be achieved. How do I get a quotation for my Terracotta flooring? How do you clean and seal a Terracotta floor? 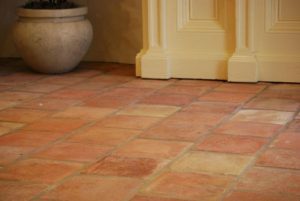 There is another page which shows how your Terracotta floor can be cleaned and sealed. Typically most Terracotta floors can take between 1 and 2 days to complete. Check out the page below.